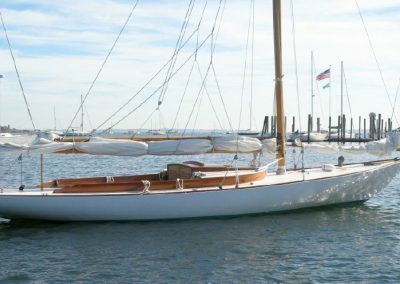 SAY WHEN One of five Buzzards Bay 25s built by Brooklin Boat Yard in the 1990s based on the original Herreshoff drawings from 1914. 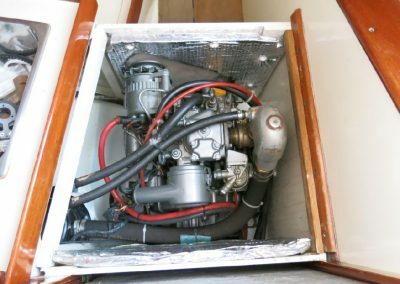 In immaculate condition; lightly used by two multi-boat owners; stored indoors in the off-season and constantly maintained and upgraded since new. 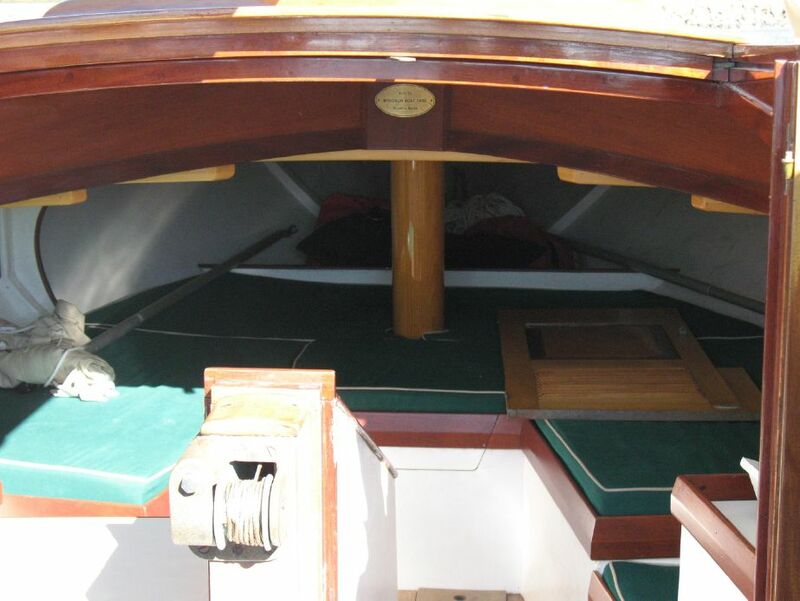 Cold-molded, wood-epoxy construction using WEST Systems epoxies for adhesion and coatings. 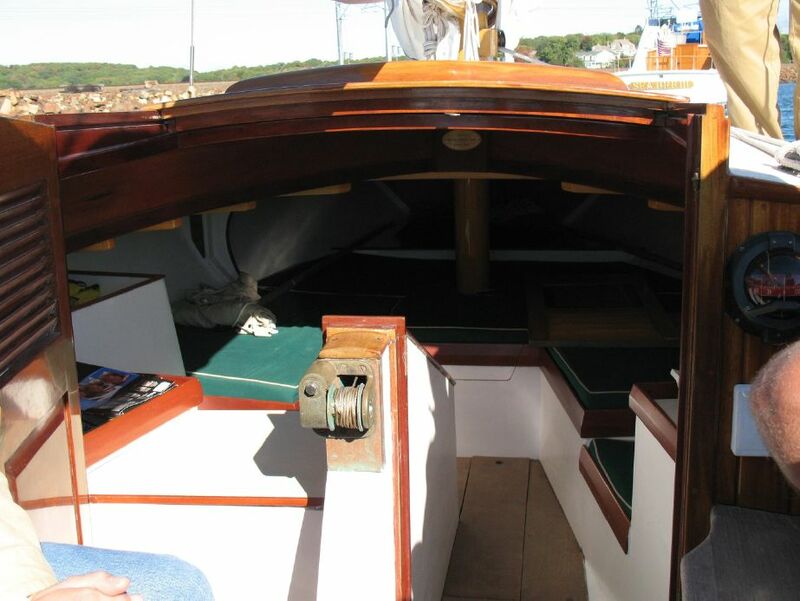 Decks and cabin top are marine plywood over-laid with Dynel cloth set in epoxy. 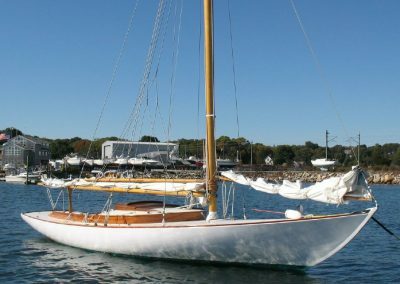 One of five BB-25s built by Joel White in the 1990s to the 1914 HMCo design, based on the original Herreshoff Mfg. 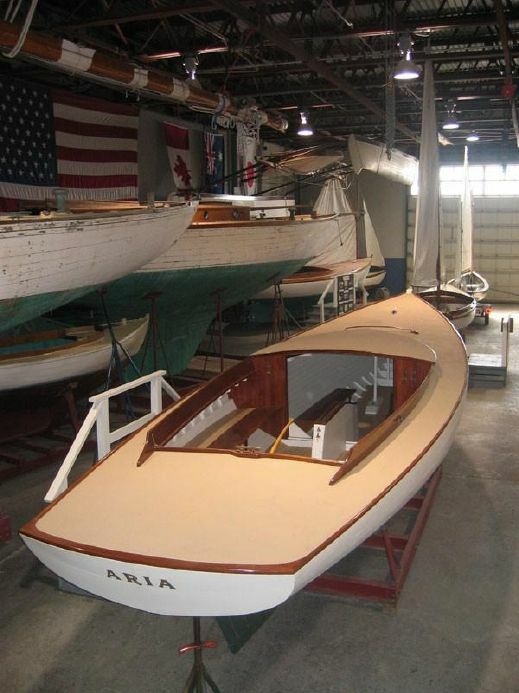 Co. drawings at MIT’s Hart Nautical Collections. 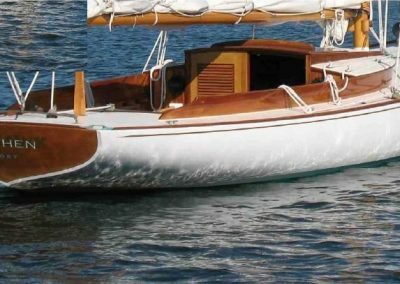 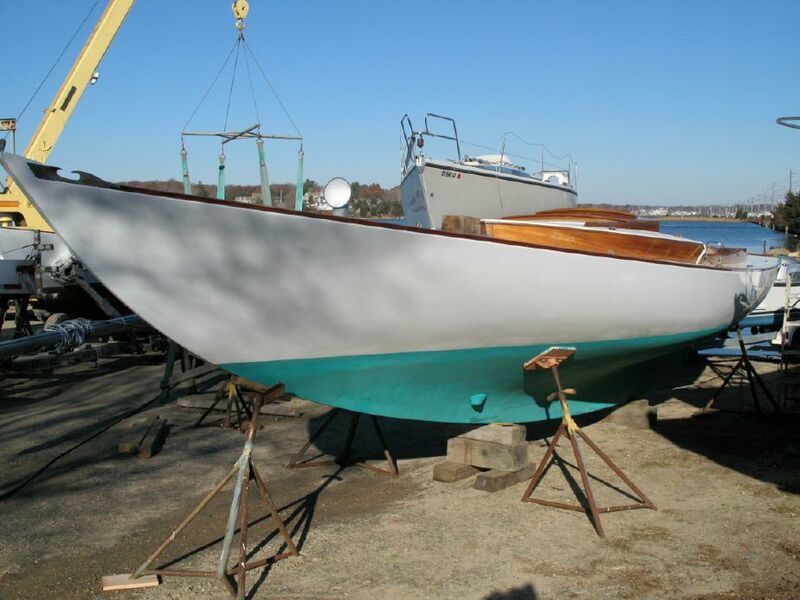 Brooklin Boat Yard wood construction and coldmolded epoxy technology achieved great strength, rigidity, and stability with low maintenance. 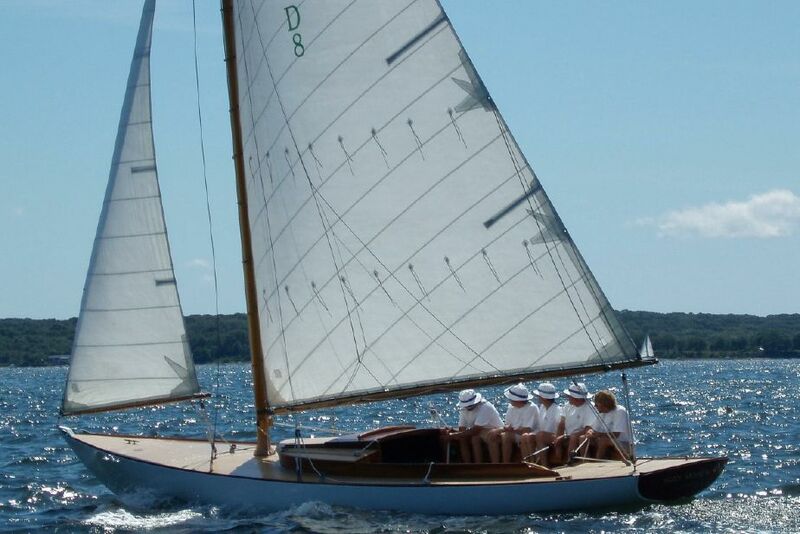 Beautiful, hugely powerful, impeccable and completely up-to-date; mint condition, needs nothing, everything works perfectly; ready for “Spirit of Tradition” Classics racing and fabulous day-sailing and overnight cruising. 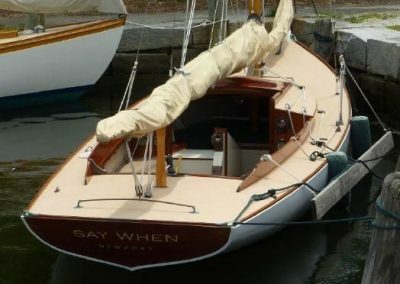 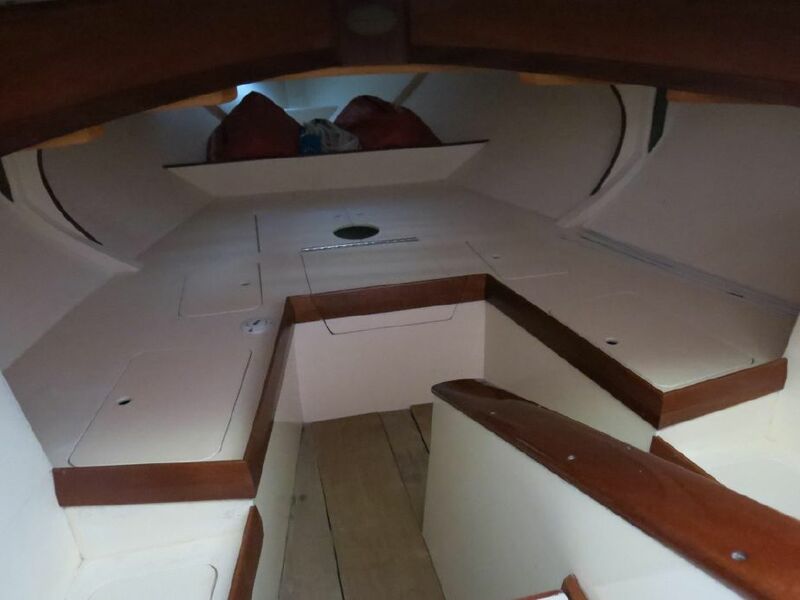 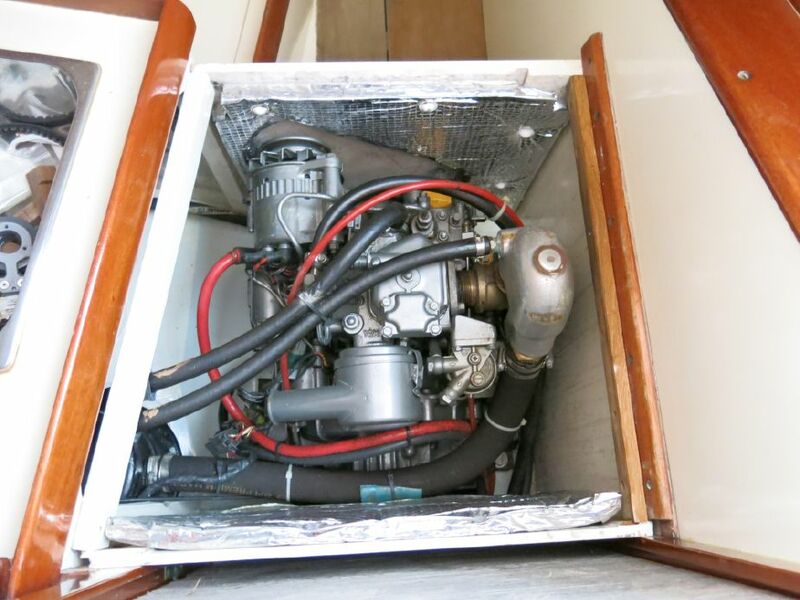 In immaculate condition: lightly used by two multi-boat owners; stored indoors in the off-season and constantly maintained and upgraded by Bruce Avery at Noank since new. 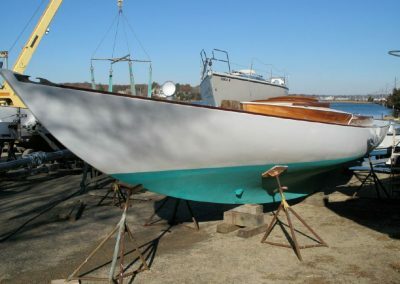 Fresh paint in and out (including cabin ceiling, lockers, bilges, and engine box) and varnish detailing (including spars) yearly. 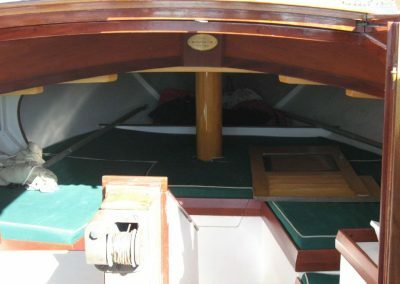 All new canvas, 2009: new cabin-cushion foam, dark green Sunbrella cushion covers, and padded storage bags for two cabin doors. Sail-away equipped with 8 life preservers, 2 fenders with new (2011) dark green fleece fender covers and matching green braid dock lines, heavy anchor with chain and rope rode, lunch hook with rode, boat hook. L. Francis Herreshoff noted that the Buzzards Bay 25 was his father’s favorite design. 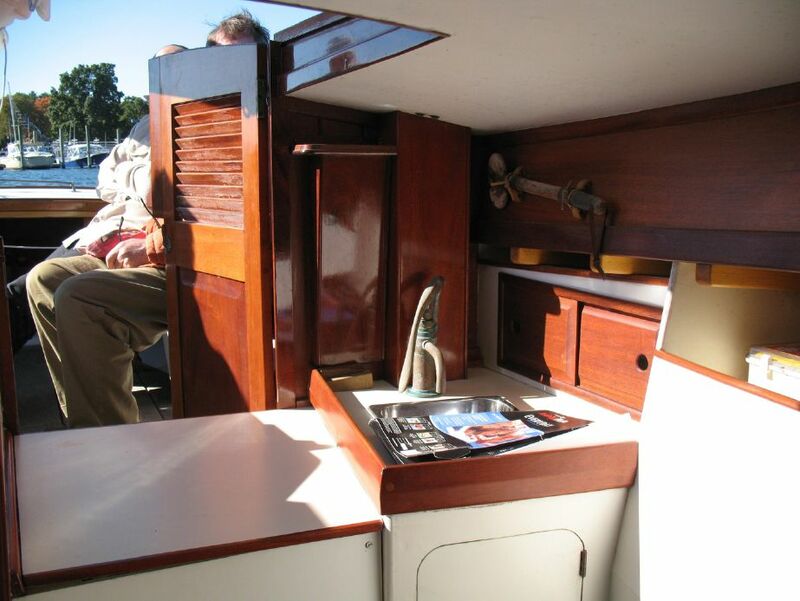 Noted more for his engineering than his art, Captain Nat made a fine showing on both fronts with the BB25. 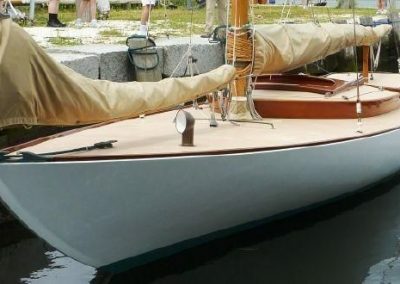 Not only is she stunning to look at with the refined sheer and hollow bow, but she embodies every bit of the engineering genius NGH was famous for. 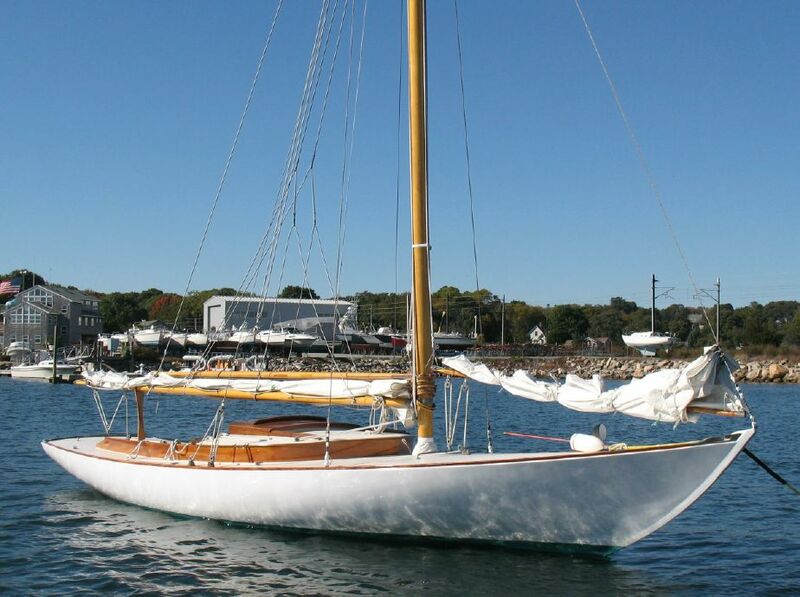 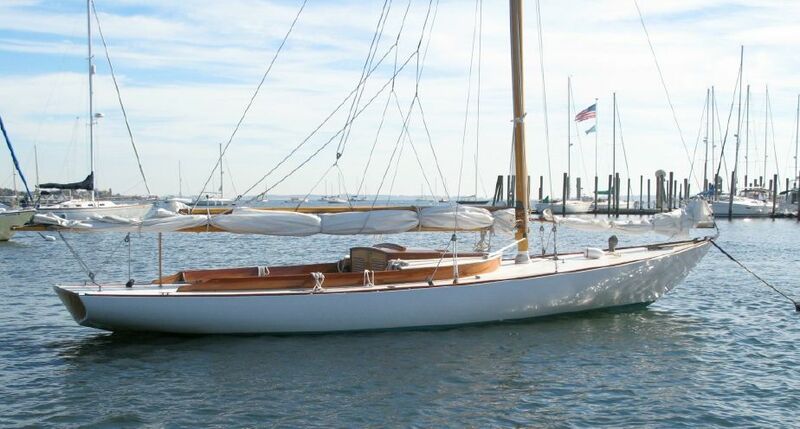 The Buzzards Bay 25 was designed in 1914. 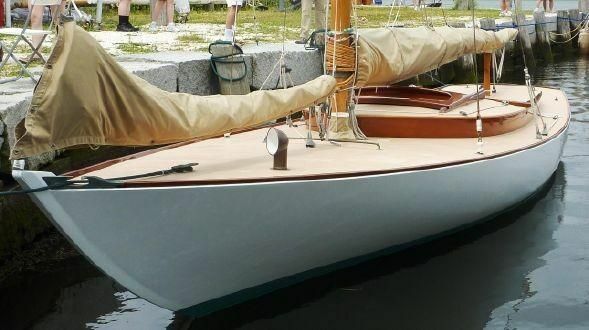 In vogue at the time were lightly built boats with long overhangs. 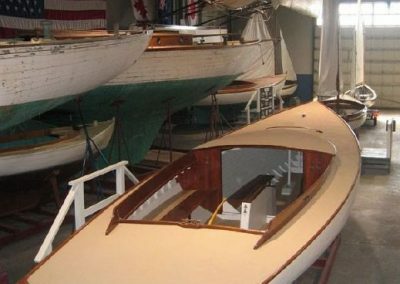 Boats were raced hard every season, and they had a tendency to “hog” and leak. 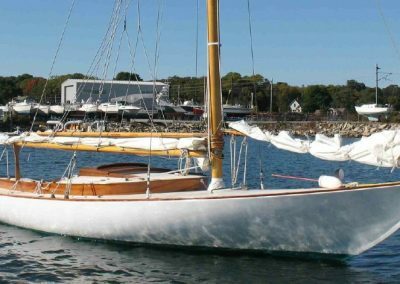 Like the famous 12-1/2 footers, the BB25 was designed for the choppy, shallow waters of Buzzards Bay. 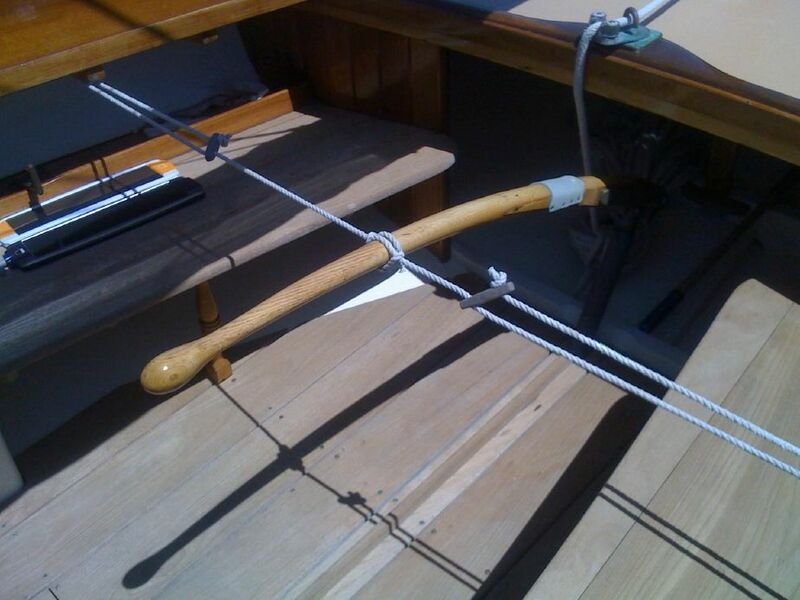 It had a hollow bow, higher freeboard, and shorter overhangs than many of its predecessors. 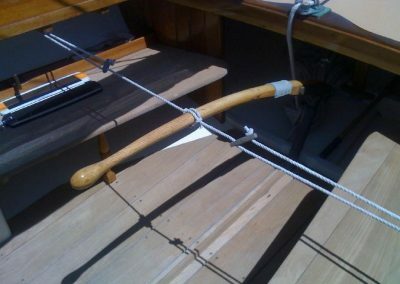 The hollow bow helps keep the boat dry, and the shorter overhangs provide improved durability. 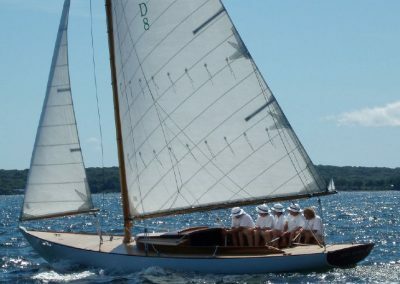 The BB25 is quite fast, and they have always done well in sailing regattas. 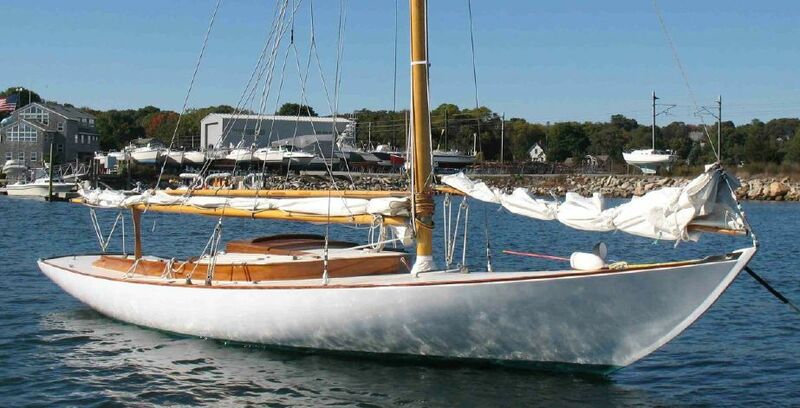 The boat is a “compromise sloop”, meaning it has both a ballast keel and centerboard, to accommodate shoal water. 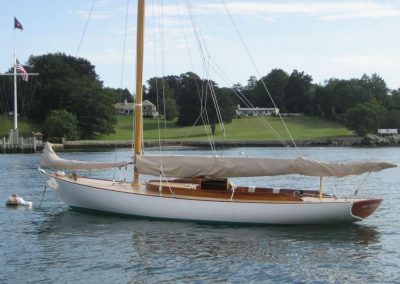 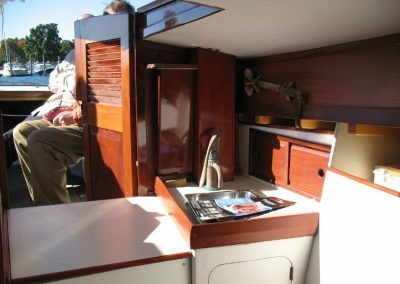 It is one of the largest open cockpit boats built by Herreshoff Manufacturing Co. and has an enormous gaff rig with nearly 550 square feet of sail.